To determine whether IL-4 is therapeutic in treating established experimental arthritis, a recombinant adenovirus carrying the gene that encodes murine IL-4 (Ad-mIL-4) was used for periarticular injection into the ankle joints into mice with established collagen-induced arthritis (CIA). Periarticular injection of Ad-mIL-4 resulted in a reduction in the severity of arthritis and joint swelling compared with saline- and adenoviral control groups. Local expression of IL-4 also reduced macroscopic signs of joint inflammation and bone erosion. Moreover, injection of Ad-mIL-4 into the hind ankle joints resulted in a decrease in disease severity in the untreated front paws. Systemic delivery of murine IL-4 by intravenous injection of Ad-mIL-4 resulted in a significant reduction in the severity of early-stage arthritis. Rheumatoid arthritis (RA) is a chronic systemic autoimmune diseasethat is characterized by joint inflammation, and progressive cartilage and boneerosion. Recent research has identified certain biologic agents that appearmore able than conventional therapies to halt effectively the progression ofdisease, as well as ameliorate disease symptoms. One potential problem with theuse of biologic agents for arthritis therapy is the need for daily or weeklyrepeat dosing. The transfer of genes directly to the synovial lining cantheoretically circumvent the need for repeat dosing and reduce potentialsystemic side effects [1,2].However, although many genes have been effective in treating murine CIA ifadministrated at a time before disease onset, local intra-articular orperiarticular gene transfer has not been highly effective in halting theprogression of established disease. IL-4, similar to tumor necrosis factor(TNF)-α and IL-1 inhibitors, has been shown be therapeutic for thetreatment of murine CIA when administered intravenously as a recombinantprotein, either alone or in combination with IL-10. IL-4 can downregulate theproduction of proinflammatory and T-helper (Th)1-type cytokines by inducingmRNA degradation and upregulating the expression of inhibitors ofproinflammatory cytokines such as IL-1 receptor antagonist (IL-1Ra) [3,4]. IL-4 is able to inhibit IL-2 andIFN-γ production by Th1 cells, resulting in suppression of macrophageactivation and the production of the proinflammatory cytokines IL-1, IL-6,IL-8, and TNF-α by monocytes and macrophages [4,5,6,7,8,9]. In order to examine the therapeutic effects of local and systemicIL-4 expression in established CIA, an adenoviral vector carrying the gene formurine IL-4 (Ad-mIL-4) was generated. The ability of Ad-mIL-4 to treatestablished CIA was evaluated by local periarticular and systemic intravenousinjection of Ad-mIL-4 into mice at various times after disease onset. Male DBA/1 lacJ (H-2 q ) mice, aged 7-8 weeks,were purchased from The Jackson Laboratory (Bar Harbor, ME, USA). The mice wereimmunized intradermally at the base of tail with 100 μ g bovine type IIcollagen. On day 21 after priming, mice received a boost injection(intradermally) with 100 μ g type II collagen in incomplete adjuvant. Forthe synchronous onset of arthritis, 40 μ g lipopolysaccharide (Sigma, StLouis, MO, USA) was injected intraperitoneally on day 28. Ad-mIL-4 was injectedperiarticularly into the hind ankle joints of mice on day 32 or intravenouslyby tail vein injection on day 29. Disease severity was monitored every otherday using an established macroscopic scoring system ranging from 0 to 4: 0,normal; 1, detectable arthritis with erythma; 2, significant swelling andredness; 3, severe swelling and redness from joint to digit; and 4, maximalswelling with ankylosis. The average of macroscopic score was expressed as acumulative value for all paws, with a maximum possible score of 16 per mouse.Cytokine production by joint tissue or serum were assessed using enzyme-linkedimmunosorbent assay (ELISA; R&D Systems, Minneapolis, MN, USA). To examine the therapeutic effects of IL-4 gene transfer in amurine model of arthritis, 5×108 particles of Ad-mIL-4 andenhanced green fluorescent protein (Ad-eGFP) were administered by periarticularinjection into the ankle joints of mice with established disease 4 days afterlipopolysaccharide injection. All mice had established disease at time ofinjection. As shown in Figure 1, the severity ofarthritis (Fig. 1a), paw thickness (Fig. 1b), and the number of arthritic paws (Fig. 1c) were all significantly reduced in the Ad-mIL-4 group,compared with the saline- and Ad-eGFP-treated groups. Analysis of the bones inthe ankle joints of control arthritic mice showed evidence of erosion with anassociated monocytic infiltrate around the joint space compared with theAd-mIL-4-treated and nonarthritic control joints. In addition, injection of theankle joints in the hind legs resulted in a therapeutic effect in the frontpaws. A similar contralateral effect has been observed with adenoviral-mediateddelivery of viral (v)-IL-10. Interestingly, a high level of murine IL-10 alsowas detected from the joint lysates of Ad-mIL-4-treated naïve andarthritic mice, with the production of endogenous IL-10 correlating with thedose of Ad-mIL-4. The administration of recombinant IL-4 protein systemicallyhas been shown to be therapeutic in murine CIA models if given before diseaseonset. To examine the effect of systemic IL-4 delivered by gene transfer,1×109 particles of Ad-mIL-4 were injected via the tail vein ofcollagen-immunized mice the day after lipopolysaccharide injection. 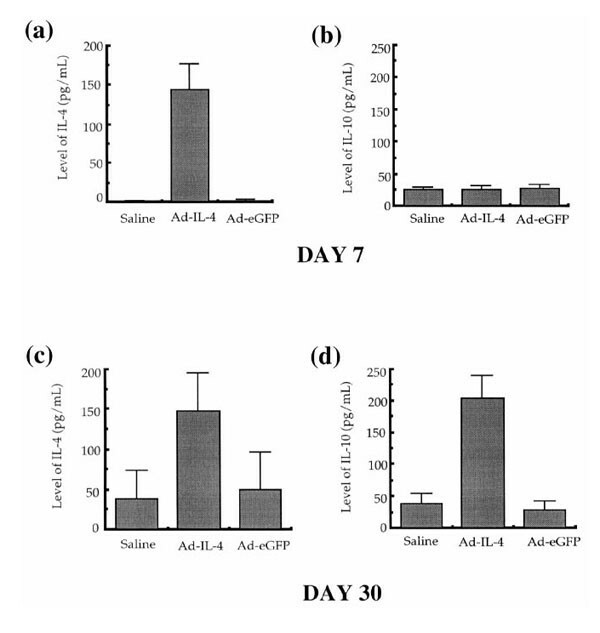 Whereas theimmunized control mice, injected with Ad-eGFP, showed disease onset on day 3after lipopolysaccharide injection, Ad-mIL-4-treated mice showed a delay indisease onset and as a reduction in the total number of arthritic paws. Also,systemic injection of Ad-mIL-4 suppressed the severity of arthritis in CIA miceaccording to arthritis index. Local delivery of Ad-mIL-4. Three days after lipopolysaccharidetreatment collagen-immunized mice were injected periarticularly with5×108 particles of Ad-mIL-4, Ad-eGFP, or saline. (a) Arthritis index. Subsequently, severity of disease was assessed every other dayusing an established macroscopic scoring system ranging from 0 to 4: 0, normal;1, detectable arthritis with erythma; 2, significant swelling and redness; 3,severe swelling and redness from joint to digit; and 4, maximal swelling withankylosis or necrosis. The average macroscopic score was expressed as acumulative value for all paws, with a maximum possible score of 16 per mouse(n = 20). *P <0.01. (b) Paw swelling. Thethickness of each paw was also evaluated using a spring-load caliper. The pawswelling for each mouse was calculated by adding the four thicknesses of theindividual paws. *P <0.1;**P<0.05. (c) Number of arthritic paws. At the same time, the totalnumber of arthritic paws were determined for each experimental group(n = 10, maximum 40 per group). *P <0.01. Histological analysis of the effect of local Ad-mIL-4 treatment inCIA. (a) Ankle joints of mice were isolated from CIA and same-agednormal DBA mice 28 days after adenovirus injection. Ankle joint tissues werestained with hematoxylin and eosin and showed 100× magnification.Particles of Ad-IL-4 or Ad-eGFP (5×108) were injected intoankle joints of mice with established CIA. (b) The joint tissue sectionswere evaluated in a blinded manner and scored as follows: 1, synovial cellproliferation, synovial hypertrophy with villus formation and/or fibrindeposition; 2, inflammation, synovitis and/or generalized inflammation; 3,cartilage disruption, chondrocyte degeneration and/or ruffling of cartilagesurface and/or dystrophic cartilage; and 4, joint destruction, cartilageerosion with abundant inflammation and pannus formation with bone erosion. Atotal of five joints per group were evaluated by at least two individuals in ablinded manner. Periarticular injection of Ad-mIL-4 into the hind leg ankle jointsconferred a therapeutic effect in the untreated, front paws. The arthritic miceinjected in the hind leg ankle joints with Ad-mIL-4, Ad-eGFP or saline wereevaluated for the severity of arthritis in either the hind, treated paws(a) or front, untreated paws (b). The macroscopic score (mean± standard deviation) is expressed as a cumulative value for the two paws,with a maximum possible score of 8. Induction of IL-10 by Ad-mIL-4 administration. Particles ofAd-IL-4, Ad-IL-10, or Ad-eGFP (5×108) were injected into theankle joints of naïve DBA mice. The animals were killed at the indicatedtime points and joint tissue homogenized. The lysate was then monitored for(a) murine IL-4 and (b) murine IL-10 using the appropriateELISA. Levels of expression of IL-4 and IL-10 in immunized mice afterperiarticular injection of diferent doses of Ad-mIL-4. Increasing doses ofAd-mIL-4 were injected periarticularly into mice with established arthritis.The animals were killed at day 35, and the joint tissue homogenized and assayedfor levels of (a) IL-4 and (b) IL-10. The doses of Ad-mIL-4 usedwere as follows: low, 5×106; mid, 5×107; andhigh, 5×108. Systemic delivery of Ad-mIL-4. Adenoviruses were injected into thetail vein 24 h after lipopolysaccharide treatment. (a) Arthritis index.Subsequently, severity of disease was assessed every other day using anestablished macroscopic scoring system ranging from 0 to 4: 0, normal; 1,detectable arthritis with erythma; 2, significant swelling and redness; 3,severe swelling and redness from joint to digit; and 4, maximal swelling withankylosis or necrosis. + The average macroscopic score was expressed as acumulative value for all paws, with a maximum possible score of 16 per mouse(n =10). *P <0.001;**P<0.0005. (b) Paw swelling. The thickness of each paw was alsoevaluated using a spring-load caliper. The paw swelling for each mouse wascalculated by adding the four thicknesses of the individual paws. *P <0.05; **P <0.001. (c) Number of arthritis paws. The total number of arthritic paws were determinedfor each experimental group (maximum 40 per group). *P<0.001. Serum IL-4 and IL-10 levels following systemic Ad-mIL-4 deliveryAd-mIL-4 was delivered to mice by tail vein injection 30 days afterimmunization. A week and 30 days after Ad-mIL-4 and Ad-eGFP injection, the micewere bled and serum levels of cytokines measured by ELISA. (a) IL-4secretion on day 7, (b) IL-10 secretion on day 7, (c) IL-4secretion on day 30, and (d) IL-10 secretion on day 30. Gene therapy represents a novel approach for delivery oftherapeutic agents to joints in order to treat the pathologies associated withRA and osteoarthritis, as well as other disorders of the joints. In the presentstudy we examined the ability of local periarticular and systemic gene transferof IL-4 to treat established and early-stage murine CIA, respectively. We havedemonstrated that both local and systemic administration of Ad-mIL-4 resultedin a reduction in the severity of arthritis, as well as in the number ofarthritic paws. In addition, the local gene transfer of IL-4 reduced histologicsigns of inflammation and of bone erosion. Interestingly, local delivery ofAd-mIL-4 was able to confer a therapeutic effect to the untreated, front pawsthrough a currently unknown mechanism. In addition, both local and systemicexpression of IL-4 resulted in an increase in the level of endogenous IL-10, aswell as of IL-1Ra (data not shown). Previous experiments have shown that genetransfer of IL-10 and IL-1 and TNF inhibitors at the time of disease initiation(day 28) is therapeutic. However, delivery of these agents after disease onsetappeared to have only limited therapeutic effect. In contrast, the presentresults demonstrate that IL-4, resulting from local periarticular and systemicinjection of Ad-mIL-4, was able partially to reverse progression of establishedand early-stage disease, respectively. These results, as well as those ofothers, support the potential application of IL-4 gene therapy for the clinicaltreatment of RA. RA is a chronic systemic autoimmune disease that is characterized by joint inflammation, and progressive cartilage and bone erosion. Currently the symptoms of arthritis are managed using pharmacologic agents, including both steroidal and nonsteroidal drugs, and disease-modifying drugs such as methotrexate. No pharmacologic agents have yet proven effective in halting the progression of disease, however. Recent research has identified certain biologic agents that appear more able than conventional therapies to halt effectively the progression of disease, as well as ameliorate disease symptoms. In particular, inhibitors of TNF-α and IL-1 have proven effective in clinical trials, and the US Food and Drug Administration has approved the use of soluble TNF-α receptor for treatment of human RA. One potential problem with the use of biologic agents for arthritis therapy is the need for daily or weekly repeat dosing. The transfer of genes directly to the synovial lining can theoretically circumvent the need for repeat dosing and reduce potential systemic side effects [1,2]. Ex-vivo and in-vivo methods have been used to deliver therapeutic genes such as those that encode IL-10, v-IL-10, soluble TNF and IL-1 receptors, and IL-1Ra to arthritic mouse , rat , dog , and rabbit joints . Although many genes have been effective in treating murine CIA if they are administered before disease onset, local periarticular gene transfer has not been highly effective in halting the progression of established disease. IL-4, similar to TNF-α and IL-1 inhibitors, has been shown be therapeutic for the treatment of murine CIA when administered intravenously as a recombinant protein, either alone or in combination with IL-10. IL-4 can down-regulate the production of proinflammatory and Th1-type cytokines by inducing mRNA degradation and upregulating the expression of inhibitors of proinflammatory cytokines such as IL-1Ra [3,4]. IL-4 is able to inhibit IL-2 and IFN-γ production by Th1 cells, resulting in suppression of macrophage activation and the production of the proinflammatory cytokines IL-1, IL-6, IL-8, and TNF-α by monocytes and macrophages [5,6,7,8,9]. In addition, IL-4 inhibits growth factor-induced RA synoviocyte proliferation, and expression of prostaglandin E and matrix metalloproteinase-3 in RA synovial fibroblast [14,15,16], and reduces bone resorption. Given that IL-4 is able to inhibit the production of both IL-1 and TNF-α, block synovial cell proliferation and bone loss, and promote the formation of Th2 lymphocytes, it represents an attractive cytokine for treating arthritis by gene transfer. To examine the therapeutic effects of local and systemic IL-4 expression in established CIA, we have generated an adenoviral vector carrying the gene for murine IL-4 (Ad-mIL-4). The ability of Ad-mIL-4 to treat established CIA was evaluated by local periarticular and systemic intravenous injections of Ad-mIL-4 into mice at various times after disease onset. Local injection of Ad-mIL-4 resulted in a reduction in the severity of arthritis and joint swelling, and reduced macroscopic signs of joint inflammation and bone erosion. Injection of the ankle joints in the hind legs also resulted in a therapeutic effect in the untreated, front paws. A high level of endogenous murine IL-10 was detected in the joint tissues of mice injected locally with Ad-mIL-4. Systemic delivery of murine IL-4 by intravenous injection of Ad-mIL-4 also resulted in a slight delay in the onset of disease, with a significant reduction in the number of arthritic paws. These results demonstrate that local and systemic gene transfer of IL-4 is able to treat established and early-stage disease, respectively, in a mouse model of arthritis, and thus may be useful for clinical applications for the treatment of RA. Male DBA/1 lacJ (H-2 q ) mice, aged 7-8 weeks, were purchased from The Jackson Laboratory. They were maintained in a specific pathogen-free animal facility of the University of Pittsburgh Biotechnology Center. For local periarticular injection, mice were anesthetized with inhalation of 2.5% isoflurane gas. A maximum of 5 μ l diluted adenovirus was injected into joint articular space under the ankle joint bone in each hind paw with a 26-gauge Hamilton syringe. For systemic delivery of adenovirus, 500μ l diluted adenovirus was injected intravenously via the tail vein. Ad-mIL-4 was constructed and propagated according to standard protocols, as previously described . Briefly, recombinant adenoviruses were generated by homologous recombination in CRE8 cells, a 293 cell line that expresses Cre recombinase, between psi-5, an Ad5-derived, E1- and E3-deleted adenovirus, and pAd-lox, the adenoviral shuttle vector that expresses IL-4. The inserted cDNA sequences are expressed under the transcriptional control of human cytomegalovirus promoter. Vectors were purified using two consecutive CsCl gradient ultracentrifugation, dialyzed at 4°C against sterile virus buffer, aliquoted, and stored at -80°C until use. The titers of the adenoviral stocks were determined by incubating serial dilutions of the stocks at 37°C for 60 min with sub-confluent 293 cells. Viral titers were calculated by determining the highest dilution that produced 100% viral cytopathic effect, which was then multiplied by the number of cells per well and by the dilution factor. CRE8 and 293 cell lines were grown in Dulbecco's modified eagle medium (GIBCO-BRL, Rockville, MD, USA) supplemented with 10% fetal bovine serum. Bovine typeII collagen (Chondrex, Seattle, WA, USA) was dissolved in 0.05mol/l acetic acid at a concentration of 2mg/ml by stirring overnight at 4°C and emulsified in equal volumes of FCA containing 2mg/ml heat-killed Mycobacterium tuberculosis strain H37Ra. The mice were immunized intradermally at the base of tail with 100 μ g collagen. On day 21 after priming, the mice were boosted with 100μ g type II collagen in incomplete adjuvant. In order to synchronize the onset of arthritis, 40 μ g lipopolysaccharide (Sigma) was injected intraperitoneally on day 28. Disease severity was assessed every other day using an established macroscopic scoring system ranging from 0 to 4: 0, normal; 1, detectable arthritis with erythma; 2, significant swelling and redness; 3, severe swelling and redness from joint to digit; and 4, maximal swelling with ankylosis. The macroscopic score (mean ± standard deviation) was expressed as a cumulative value for all paws, with a maximum possible score of 16. The thickness of each paw was also measured using a spring-load caliper. The paw swelling for each mouse was calculated by adding the four thicknesses of the individual paws. In addition, the number of arthritic paws of individual mice were counted and added to represent the number of arthritic paws in a group. The in vivo experiments were performed with 10 mice/group and repeated three times to ensure reproducibility. Joint tissues from freshly dissected mice were immersion-fixed in 10% neutral buffered formalin and decalcified in 15% ethylene diamine tetra-acetic acid/30% glycerol for 2 weeks. Tissues were then dehydrated in graded alcohols, embedded in paraplast, sectioned at 5μ m on a microtome, and stained with hematoxylin and eosin. Sections were evaluated in a blinded manner for histologic signs of arthritis and scored as follows: 1, synovial cell proliferation, synovial hypertrophy with villus formation and/or fibrin deposition; 2, inflammation, synovitis and/or generalized inflammation; 3, cartilage disruption, chondrocyte degeneration and/or ruffling of cartilage surface and/or dystrophic cartilage; and 4, joint destruction, cartilage erosion with abundant inflammation and pannus formation with bone erosion. Serum level of antibody against type II collagen was measured using a standard ELISA assay. Briefly, a 96-well Immuno-Maxisorp Plate (Nunc, Naperville, IL, USA) was coated with bovine type II collagen (10 μ g/ml) overnight at 4°C and blocked with 10% fetal bovine serum in phosphate-buffered saline. Sample sera were diluted to 1:100000 (vol:vol) and incubated for 2h at 37°C. After washing, bound antibody isotope was detected with biotin-conjugated antimouse whole IgG (heavy and light chain) antibody (Pharmingen, San Diego, CA, USA). Thereafter, plates were washed, incubated with 100 μ l 2,2-azino-di-(-3-ethyl-benzthiazolinesulfonate) substrate (ABTS; Boeringer Mannheim, Indianapolis, IN, USA) at 1mg/ml and read at 405nm. Cytokine production in the joint tissue or serum was assessed by ELISA (R&D systems). For measuring the cytokine production, peeled joint tissues from the upper portion of ankle to the middle of the paw were ground by homogenizer in the equal volume of the lysis buffer (100mmol/l potassuim phosphate, pH 7.8 and 0.2% Triton-X 100). Cytokine production was standardized as amount of cytokine per gram of tissue. Results were compared using the Student's t-test and by analysis of variance. P <0.05 was considered statistically significant. To establish CIA, 8-week-old aged DBA1/lacJ male mice were immunized with 100 μ g bovine type II collagen emulsified in complete adjuvant. After 21 days, the mice were boosted with the same amount of collagen in incomplete adjuvant, with disease pathology observed starting 28 days after immunization. In order to synchronize the onset of arthritis, lipopolysaccharide was injected intraperitoneally on day 28, excluding the mice that had already showed signs of disease pathology. All of the collagen-immunized mice had swollen and red paws and ankle joints within 3 days after lipopolysaccharide injection. In order to examine the therapeutic effects of IL-4 gene transfer in a murine model of arthritis, increasing doses of an Ad-mIL-4 recombinant virus were administered by periarticular injection into the hind ankle joints of mice with established disease 4 days after lipopolysaccharide injection. As shown in Figure 1, all mice had established disease at time of injection. However, the severity of arthritis (Fig. 1a), paw thickness (Fig. 1b), and the number of arthritic paws (Fig. 1c) were all significantly reduced in the Ad-mIL-4 group, compared with the saline- and Ad-eGFP-treated groups. Analysis of the bones in the ankle joints of control arthritic mice showed evidence of erosion with an associated monocytic infiltrate around the joint space (Fig. 2a) compared with the nonarthritic control joints. In contrast, the joints from Ad-mIL-4-treated mice showed less inflammatory joint tissue, reduction in bone erosion, and reduction in the number of inflammatory cells. The changes in histology of the ankle joints from sections from five mice per group were also scored in a blinded manner. As shown in Figure 2b, significant inhibition of disease progression as assessed by joint histology was observed in the Ad-mIL-4-treated group. These results suggest that local expression of IL-4 after gene transfer to joints with established disease could effectively protect tissue from inflammation as well as block bone erosion. It is important to note that the possible inflammatory responses to adenoviral injection were examined by injection of the same number of particles of Ad-mIL-4 and Ad-eGFP into naïve joints of DBA mice. At the doses of virus used, however, no inflammation was observed (data not shown). Previously, we have noted a contralateral effect, in which treatment of a diseased joint by adenovirus-mediated transfer of the gene that encodes v-IL-10 resulted in a therapeutic effect in noninjected joints. To determine whether Ad-mIL-4 was able to confer a contralateral effect, the severity of disease in the hind and front paws of the mice injected only in the hind ankle joints was evaluated. As shown in Figure 3a, a reduction in the arthritis index was observed in the Ad-mIL-4 injected hind leg ankle joints of the CIA mice. Interestingly, the noninjected front paws also showed a statistically significant reduction in the severity of arthritis (Fig. 3b). Taken together, these results suggest that local periarticular injection of Ad-mIL-4 resulted in a therapeutic effect in both injected and noninjected joints. However, unlike v-IL-10, IL-4 is able to confer a contralateral therapeutic effect in mice with established disease. To test the level and duration of gene expression, 5×108 particles of Ad-mIL-4, Ad-mIL-10, and Ad-eGFP were injected periarticularly into the ankle joints of naïve DBA1 mice. Joint tissues were isolated at indicated time points, homogenized in lysis buffer, and the lysates analyzed for cytokine production by ELISA. Maximal IL-4 expression was detected on day 7, with the level gradually decreasing over time (Fig. 4a). However, it is important to note that it is unclear whether the level of IL-4 detected in the joints at the different time points is partially due to induction of endogenous IL-4. Interestingly, a high level of murine IL-10 also was detected from the joint lysates of Ad-mIL-4-injected animals (Fig. 4b) that directly correlated with the dose of Ad-mIL-4 (data not shown). An increase in the level of IL-10 expression could even be detected 3 weeks after injection of a high dose of Ad-mIL-4. The levels of IL-4 and IL-10 expression also were examined in arthritic mice treated with Ad-mIL-4 at day 35 after injection. As shown in Figure 5a, a slight increase in IL-4 expression was observed in that correlated with the dose of Ad-mIL-4 (Fig. 5a). A similar increase at day 35 was also observed in naïve mice (data not shown). In addition, a significant dose-dependent increase in the level of endogenous IL-10 35 days after Ad-mIL-4 administration was observed in the CIA-treated animals (Fig. 5b). These results demonstrated that IL-4 transgene expression was detectable for up to 5 weeks after Ad-mIL-4 delivery and that IL-4 was able to induce the production of endogenous IL-10 in the joints of both naïve and immunized mice. In addition, expression of IL-4 resulted in a twofold increase in the level of endogenous IL-1Ra (data not shown). In contrast, periarticular injection of Ad-mIL-10 did not affect the level of expression of endogenous levels of IL-4 (Fig. 4a) and IL-1Ra (data not shown). Taken together, these results suggest that the therapeutic effects of exogenous IL-4 could be mediated in part through the induction of endogenous IL-4 and IL-1Ra. The administration of recombinant IL-4 protein systemically has been shown to be therapeutic in murine CIA models if given before onset of disease onset. To examine the effect of systemic IL-4 delivered by gene transfer, 109 particles of Ad-mIL-4 were administered intravenously by tail vein injection of the collagen-immunized mice on the day after lipopolysaccharide injection. Whereas the immunized mice injected with Ad-eGFP showed disease onset on day 3 after lipopolysaccharide injection, IL-4-treated mice showed a delay in disease onset (Fig. 6a) as well as a reduction in the total number of arthritic paws (Fig. 6c). 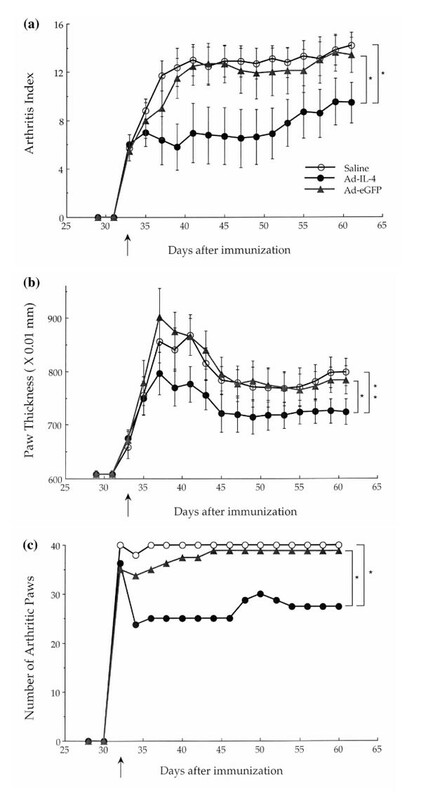 In addition, seven out of the 15 Ad-mIL-4-treated mice were disease-free for up to 10 days after lipopolysaccharide injection, and two mice were disease free at the end of the experiment on day 65. In addition, systemic injection of Ad-mIL-4 suppressed the severity of arthritis in the CIA mice according to arthritis index (Fig. 6b). Thus, systemic delivery of IL-4 by adenovirus-mediated gene transfer is able to reduce the onset and severity of early-stage disease. To examine the duration of IL-4 expression as well as induction of endogenous IL-10 expression, serum was collected from the mice and tested for levels of IL-4 and IL-10 (Fig. 7). An elevated level of IL-4 was detected in on day 7 (Fig. 7a) and on day 30 (Fig. 7c) after IL-4 injection. In addition, although there was no observed increase in the expression of IL-10 in the sera at day 7 after systemic delivery of IL-4 (Fig. 7b), IL-10 was elevated in the sera at day 35 (Fig. 7d). In contrast, the levels of IL-4 and IL-10 in the saline or Ad-eGFP-treated control groups were not significantly above background after either or local Ad-mIL-4 delivery. Thus, the early therapeutic effects of IL-4 after systemic delivery most likely are not mediated by IL-10. In contrast, it is possible that the therapeutic effects of IL-4 after local injection are conferred in part by IL-10. Gene therapy represents a novel approach for delivery of therapeutic agents to joints in order to treat the pathologies associated with RA and osteoarthritis, as well as other disorders of the joints. Previously, we and others have shown that local ex vivo and in vivo gene transfer of v-IL-10, IL-1Ra, IFN-γ, soluble IL-1 receptor, and soluble TNF receptor are able to block certain intra-articular pathologies in rabbit, rat, and murine models of arthritis. IL-4, like IL-10, is a Th2 cytokine that has been demonstrated to be therapeutic for the treatment of arthritis after systemic administration of recombinant protein. In the present study we examined the ability of local periarticular gene transfer of IL-4 to treat established murine CIA. We demonstrated that both local and systemic administration of Ad-mIL-4 resulted in a reduction in the severity of established and early-stage arthritis, respectively, as well as in the number of arthritic paws. In addition, the local gene transfer of Ad-mIL-4 reduced histologic signs of inflammation as well as bone erosion. Previous experiments have shown that gene transfer of IL-10 and IL-1 and TNF inhibitors at the time of disease initiation (day 28) was therapeutic. However, delivery of these agents after disease onset appeared to have only limited therapeutic effect. 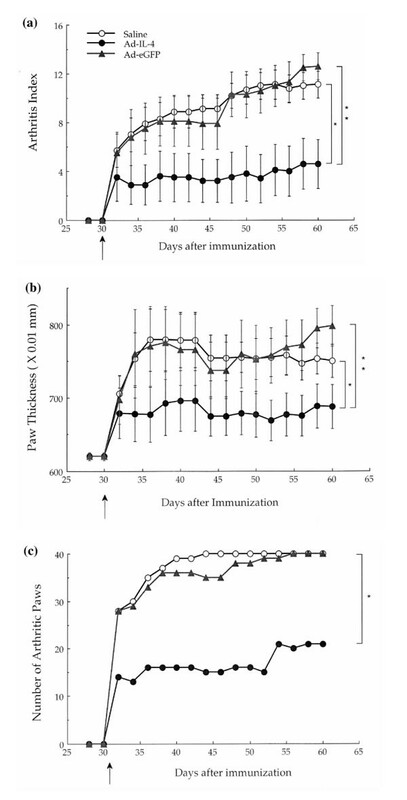 In contrast, the present results demonstrate that local IL-4 delivery was able partially to reverse progression of established disease after local periarticular injection. Interestingly, local and systemic expression of IL-4 resulted in an increase in the level of endogenous IL-10 as well as IL-1Ra. Previous reports have shown that an additive or possible synergistic therapeutic effect can be achieved in animal models of arthritis with combined treatment with recombinant IL-4 and IL-10. Treatment of mice with IL-4 and IL-10 results in reduction in TNF-α and IL-1β production with a concomitant shift in the IL-1Ra:IL-1 ratio [18,19]. The fact that the therapeutic effects of IL-4 and IL-10 are potentially synergistic is possibly due to the fact that they suppress proinflammatory mediator production through different mechanisms. IL-4 is able to block transcription of TNF and IL-1 genes, whereas IL-10 stimulates degradation of TNF and IL-1β mRNAs . Thus, it is likely that the therapeutic effects we observed after local injection of Ad-mIL-4 are due to both exogenous IL-4 and endogenous IL-10 production. However, the delayed induction of IL-10 after systemic administration of Ad-mIL-4 suggests that the initial therapeutic effects are not conferred by IL-10. A mechanism whereby IL-4 may alter IL-10 and IL-1Ra levels could involve the regulation of transcription factors that regulate the respective genes for these cytokines. In particular, nuclear factor-κ B and signal transducer and activator of transcription-6 are important for conferring transcriptional regulation by IL-4. Signal transducer and activator of transcription-6, after tyrosine phosphorylation, can bind directly to nuclear factor-κ B , resulting in synergic activation in certain cell types. The present results suggest that gene transfer of IL-4 can stimulate expression of endogenous cytokines, such as IL-10 and IL-1Ra, as well as possibly endogenous IL-4 expression. Endogenous IL-10, which can be induced by IL-4, is a natural suppressor of a number of inflammatory responses. Inhibition of endogenous IL-10 with neutralizing antibodies enhanced endotoxic shock, IgG immune complex-induced lung injury, and the severity of CIA [22,23,24,25]. Periarticular delivery of murine or viral IL-10 by gene transfer resulted in the inhibition of CIA in mouse models [10,26] if delivered before or at the time of disease onset. The present results are also consistent with the observation that IL-4, but not IL-10, has been shown to enhance the production of IL-1Ra by RA synovial cells [14,27]. IL-4 is a potent mediator in shifting the balance of Th1/Th2 cells and skewing the production of antibody subtypes . Th2 effector cell differentiation also is dependent on the presence of IL-4 during priming . Blocking endogenous IL-4 using neutralizing antibodies has been shown  to result not only in the absence of T cells with a Th2-like phenotype, but also in the appearance of T cells producing IL-2 and IFN-γ after restimulation. IL-4 is also able to skew the production of antibody subtype . However, we have shown that anticollagen antibody levels are already very high at day 30 after immunization and that IL-4 treatment did not significantly change these elevated levels (data not shown). In addition, we did not observe significant differences between IgG isotypes in the control and Ad-mIL-4 treated mice (data not shown). Thus, the mechanisms through which local and systemic IL-4 administration are able to suppress CIA are still unclear. We have demonstrated previously that periarticular injection of adenovirus-mediated gene transfer of v-IL-10 into the hind paws of mice with early-stage arthritis was able to confer a therapeutic effect in the untreated front paws. Similarly, administration of v-IL-10 into one knee of rabbits with antigen-induced arthritis was able to confer a therapeutic effect in the contralateral untreated knee. This observed contralateral effect was not limited to v-IL-10, in that coadministration of adenoviral vectors expressing soluble IL-1 and soluble TNF receptors also conferred a similar protective effect to untreated knees. Although the mechanism of the contralateral effect is unclear, we have demonstrated that adoptive transfer of dendritic cells from animals treated with adenovirus-mediated gene transfer of v-IL-10 to untreated immunized animals is able to confer a therapeutic effect (unpublished data). Thus, it is possible that local expression of v-IL-10 or IL-1 and TNF inhibitors modulates the activity of dendritic cells. However, although v-IL-10 is able to block early-stage disease, it is ineffective in reversing established disease. In contrast, periarticular injection of Ad-mIL-4 was able to reverse pathology in established disease not only in the treated hind paws, but also in the untreated front paws. Interestingly, we have observed that intravenous injection of naïve dendritic cells, genetically modified to express IL-4, is able to effectively treat established arthritis by inhibiting the Th1 response (unpublished data). During the preparation of this manuscript, a similar study using a recombinant Ad-mIL-4 vector for treatment of murine CIA was reported . However, the vector was administered before onset of disease into knee joints, whereas the vector in the present study was injected after disease onset into ankle joints. Similar to the present results, in that study local injection of the recombinant Ad-mIL-4 vector resulted in a reduction in bone erosion and a reduction in cartilage degradation. However, unlike the present results, no effect on joint inflammation was observed. Moreover, in the present report we demonstrated that both local and systemic injection resulted in induction of endogenous IL-10. Given the ability of IL-4 to reverse established disease partially, our studies, as well as those of others, support the potential application of IL-4 gene therapy for the clinical treatment of RA. This work was supported in part by Public Health Service Grant (AR62225) from the National Institute of Arthritis and Musculoskeletal Diseases and by Valentis Corporation.